Getting a taxi Buenos Aires is easy, you just hold up your hand and a taxi stops. The real challenge of course is to find a taxi that is half way decent. If you have ever been in a rogue cab, with cracks in the window, a smoking driver talking a mile a minute about his wife’s sexual preferences, who then proceeds to take you a long way around and doesn’t give you back enough change (and the change you get turns out to be a fake note)…then you know what I mean. I must have taken over a thousand taxis’ here by now, and I think I have finally cracked the system. If you have the time and patience, it is best to call a cab to your home (e.g. 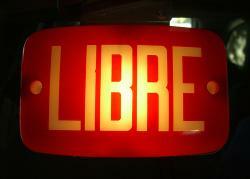 : Radio taxi 52380000, Pidalo: 49561200, Alo: 48550455, Eiffel: 43084777 or any other registered Radio Taxi company). It will usually take between 5 and 20 minutes. If it is raining or it’s the rush hour, forget about that and go out into the street to hail a cab instead. Whilst Buenos Aires is relatively safe by Latin American standards, it is important to remember some basic safety precautions. Don’t wear ostentatious jewelry, camcorders and the like. Also never take a taxi straight after getting out of cash point. It’s all about being discreet and not drawing undue attention to yourself. If hailing a cab from the street, the rule of thumb is to choose a taxi wisely. That means that you do not get into the first yellow and black vehicle that happens to be around. Take the time to check it is a genuine radio taxi (that means it has a company name and number on the passenger door, as well as a number on the front door). When getting in, check the taxi has a meter, and a driver’s registration hanging from one of the seats. You also may want to check for seat belts. Most importantly: trust your instinct. If you feel uncomfortable for whatever reason, whether because of a strong smell of booze, formula 1-style-driving or anything else, simply ask the taxi to stop, pay, get out, and get another one. If the taxi that stops for you looks dodgy on closer inspection, just say no. If the driver proceeds to shout at you and shake his fist, it only confirms you made the right decision. Most taxi drivers will engage you in a bit of conversation. They will immediately spot that you are a foreigner, and will likely ask whether you are a tourist or a resident. It is best to say that you live in the city, even if that is not true. Some drivers only ask as they want to know if they can take you a long way around without you noticing, or try to pass you a fake bill. In summer, a taxi with the windows open has no air conditioning. Closed windows mean it will be lovely and cool inside. If you are able to check for all of the above, and still have a split second left, check also that the driver isn’t smoking (unless you want to smoke too). 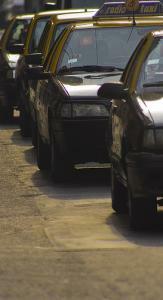 Buenos Aries’ best drivers are usually men in their sixties, so watch out for a friendly face framed with silver hair. They have survived the traffic for decades, and are likely to be decent drivers. Younger men are apt to drive like frustrated race car drivers. If traveling with a pram, it is best to keep the pram out of sight, hidden behind a tree, or folded up at your feet. The same goes for children. Many drivers will not stop for a mother struggling with a huge diaper bag, an umbrella, three crying children and an unwieldy buggy. If you should have a friendly driver who helps you pack in bags, prams and babies, who doesn’t play loud music and doesn’t smoke, it’s nice to give a tip and show your appreciation. 50 centavos or a peso is usually enough. Download Buenos Aires walking tours for your iPod. You make it sound like as Buenos Aires is quite unsafe. Is it really safe to visit? In most major cities in Asia, it’s very safe to get a taxi and you don’t have to go through all the pre-cautions you mentioned above. I was recently in Buenos Aires for the good part of 3 months. The one time, I was ripped off was getting a taxi from the domestic airport. A porteno friend said the taxis from the airport are like a mafia. And I used taxis quite a bit when I was there. But in general, I found most taxi drivers quite agreeable and I had many mini conversations usually about rock music & it was a good way to practice Spanish. Really, Buenos Aires is quite safe in my experience but you do need to “stay sharp” and always use a radio taxi. One, time I took a taxi and it was not a radio taxi; the driver was an older guy, It took me a while to realise that he was saying his brakes were not working so well… I did get to my destination in one piece. @MH – No, I wouldn’t call it unsafe – not any more than most large cities. And for the most part taxis are one of the safest ways to travel, the idea is just for you to stay sharp as Manjit says. That way you won’t get taken around the long way or given a fake bill in change. on the other hand, the guide its quite accurate, and its true, you just have to stay sharp. adn regarding safety, u can move really calmed, but, again as the guy above said, as long as u stay sharp it ll b okay! yes and no. a simple, “hola, que tal?” before getting in goes a long way. 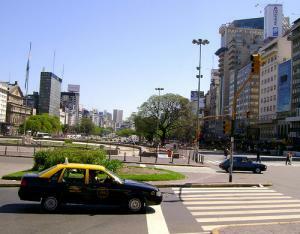 i was in BsAs for 2 weeks in May 09 and took taxis almost every day. one guy drove my girlfriend and I from plaza san martin to palermo soho, found out i was visiting from the US, and took the time to point out several important buildings along avenida cordoba as he drove. he said, “thank you for visiting my city” and even took me to the exact restaurant i wanted (for free, after the meter was turned off) when i asked to be dropped off at a nearby plaza instead. of course there are good/bad people everywhere, but don’t be put off by the few and far between. This page rendered in 0.699 seconds.